I wanted something fairly realistic, mainly because I'm not good at it. 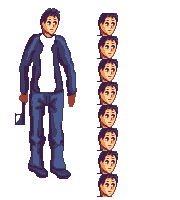 The palette is in progress, I don't like to make before my palette and yes, the thing in his hand is a axe. add some measurements to it. take a close look at the chart, which should give you an ideal starting point. Also consider that clothes, like shoes or hats are adding up. I was searching a reference like that from ages, on Da there are many, but not as good as this. Well, I tried to follow the guidelines, I couldn't stick with them too much, but it seems a lot better. PS: Cyangmou I really love your art! Your profile is awesome. I'm really glad that you replied to me. 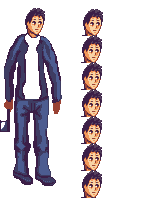 Much better, but note that one "head" is without hair, so you're head measurements are too tall by about 3 or 4 pixels, which is enough to still through off proportions quite a bit, making the torso too long. The other thing that jumps out at me is that your guy's shoulders are too narrow. 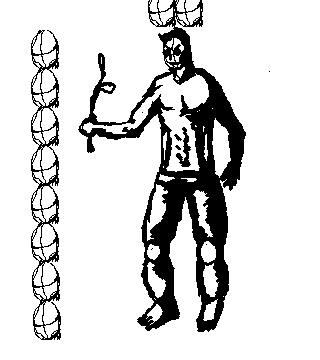 They look to be maybe 1.75 heads in width, but refer to the image Cyangmou posted again to see that these figures are all at least two heads in width. You're so Dustinaux, I continued to wonder why I couldn't fit him well... Thanks. Strangely now, I feel that he's head is a little too small. I think he should have less of an awkward stance without arms stuck out like that. 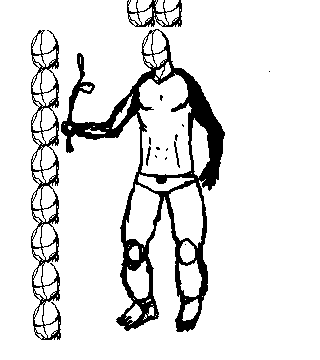 And there seems to be a disconnect between the perspective of his face and shoes vs that of his torso and body. keep the proportions you changed in mind. 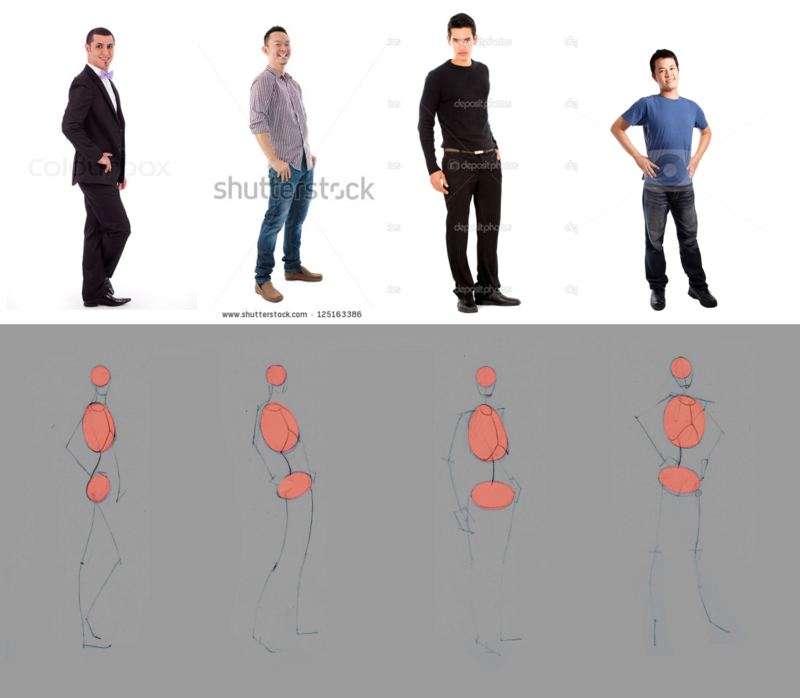 then try to get the positions for the single body parts right. Since I had the feeling that the figure wasn't ok and I needed to study some pose, I started to sketch some figure. I worked with proportions too. I left behind color and details because I wanted to perfect the shape before. I'll try with that exercise you suggested cyngmou, I still can't really see the right size/position of the parts, but I really think that with some practice I may be able to gasp it, also looking here and there I noticed that in most media there is the 7 1/2 ratio of the head, just knowing that table helped me to make a righter analysis of images and poses. if you work on a pose, don't throw in any detail first. Focus on the lines. In digital art it's really easy to overpaint things we don't like completely opaque and we can go back if we want and warp stuff, which makes it easier to get to a good looking result, then it's on paper where you have to overtrace or start from scratch. There is no flow and no weight. Try to get the pose looking good just with a few lines. you can worry about adding all the other things then. Yes, I've seen that tutorial, I think that I have even a copy. Don't know why I did use white for that, probably I just wanted a clear contrast, And I wanted something bigger because I could't read well the figure small like it was. Thanks again for that gif, it really answered many of my questions!